As January maximum temperatures spike into the high 30s and low 40s (degrees Celsius) and minimum overnight temperatures approach 30 degrees, we have had our first Heat Health alert issued by the Victorian Department of Health for 2015. On Friday 2 January 2015 heatwave conditions enveloped much of southeast Australia with temperatures reaching 43.3C in Adelaide and 38.7C in Melbourne. Overnight temperatures on Friday night (2 January) hovered about 30 degrees in Melbourne and 24.5C in Adelaide. These minimum temperatures are more than enough to disrupt sleep adding to heat stress and associated heat-related health emergencies. (see Grunstein, Too Hot to Sleep? 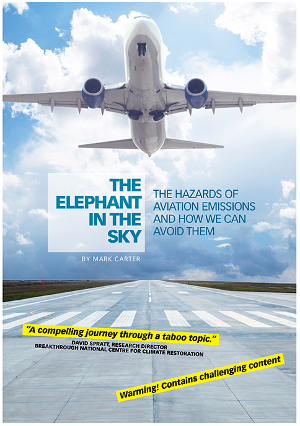 Here’s why, The Conversation, 8 January 2013). Although Melbourne was predicted to exceed 40C on Saturday (3 January) the temperature only reached 37.7C at 3.30pm. That afternoon a storm front brought some rain and relief, a cool change plunging the mercury just before 6pm. While the heat and windy conditions produced extreme fire weather conditions across much of the state with total fire bans in force, most Victorian fires were able to be managed and contained. In fact, Victoria sent two large air tankers and four Victorian firefighting teams to help fight bushfires in South Australia. While the hotspell was relatively short, it did cause some infrastructure problems with Jemena reporting electricity outage due to the heatwave in parts of Preston and Coburg. There was also a small fire reported in the Hazelwood Mine, near Morwell. The Victorian Chief Health Officer Dr Rosemary Lester issued a Heat Health alert for Friday 2nd January on 30th December for much of Victoria including Central District, North Central District, South West District, Northern Country District, Mallee District, and Wimmera District. The alert also applied for Saturday 3rd January for Northern Country District. Heat Health Alerts are advisory messages to Municipal or Shire Councils, hospital, medical and other service providers. “It is not intended to dictate when service providers take action or what actions they should take. Heat health alert recipients are advised to monitor local conditions and respond in accordance with their own heatwave plans, service continuity plans and occupational health and safety (OH&S) plans.” says the Victorian Heatwave plan (2012). 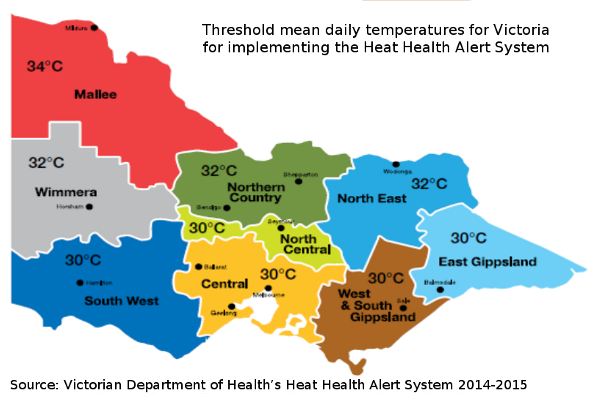 The Victorian Heat Health Alert system 2014-2015 (PDF) is based upon when daily average (or mean) temperatures are predicted to reach and exceed heat health thresholds which are set for each region in the state, based upon Bureau of Meteorology weather forecast districts and boundaries. The mean daily temperature threshold is calculated by the forecast daily maximum temperature plus the forecast daily minimum temperature for the following day (this usually occurrs overnight in the wee hours of the morning). This exceeded the 30C mean temperature threshold set by the Victorian Department of Health and hence the Heat Health Alert was issued. In the 2013-2014 summer the Victorian Department of Health issued heat health alerts for 13 days due to temperature thresholds being reached or exceeded. 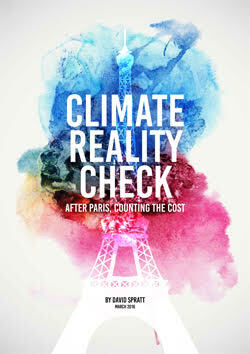 Climate change will increase the number of hot days exceeding specific temperatures and also lengthen heatwaves, both of which will increase heat related morbidity and mortality without the issue being taken very seriously and the implementation of adaptive strategies and behaviour. So how was this mean daily temperature of 30 degrees Celsius worked out as the threshold? It is based at looking at heat related morbidity (illness) and mortality statistics to see at what temperature measure a threshold is past where there is a noticeable increase in mortality or morbidity. The seminal research work was done in this area by Professor Neville Nicholls and colleagues with the publication of their 2008 paper – A simple heat alert system for Melbourne, Australia. This research used a time series analysis for the period 1996 to 2005 for people 65 years or older and determined for Melbourne a temperature mortality threshold of Mean daily temperature of 30°C, or daily minimum temperature of 24°C. The initial Victorian heatwave strategy was developed in 2007. 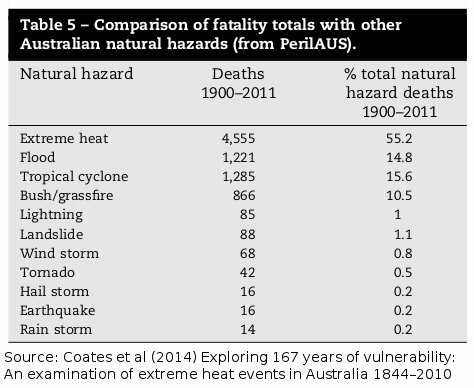 The research by Nicholls et al (2008) came too late to include in the state heatwave strategy by the Victorian Department of Health for the 2009 Victorian heatwave events. This event resulted in 374 excess deaths and enormous strain on ambulance services, hospital emergency services, mortuaries and other medical support services. The Nicholls research did inform the 2009-2010 heatwave framework and then the 2012 Heatwave plan for Victoria. Cardiac disease is a major cause of death and disability and identifying cardiac-specific climate thresholds and the spatio-demographic characteristics of vulnerable groups within populations is an important step towards preventative health care by informing public health officials and providing a guide for an early heat-health warning system. This information is especially important under current climatic conditions and for assessing the future impact of climate change. 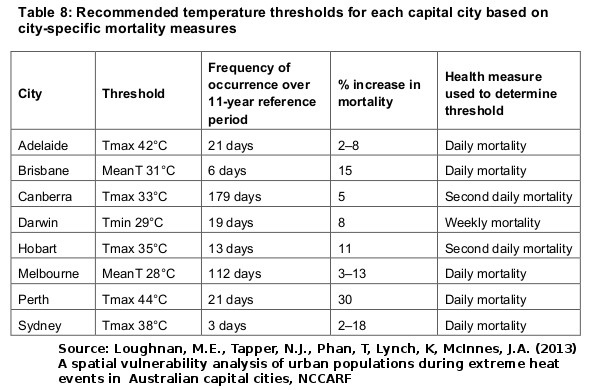 A more in depth study conducted by Loughnan and colleagues and published in 2013 by the National Climate Change Adaptation Research Facility – A spatial vulnerability analysis of urban populations during extreme heat events in Australian capital cities – goes into even more detail recommending temperature thresholds for each capital city based upon the best temperature measure to determine a threshold level for mortality. For Melbourne the optimum measure was daily mortality, where at a Mean daily Temperature of 28°C there was a 3 to 13 percent increase in mortality. Although the mean temperature (MeanT) is the optimum threshold to use for Melbourne and Brisbane to determine an increase in mortality, for other cities (Sydney, Perth, Hobart, Canberra, Adelaide) the maximum temperature (Tmax) was found to be more suitable. For Darwin it is actually the minimum temperature (Tmin) that is more appropriate to use as a threshold measurement. So it seems we have in use in Victoria threshold temperatures higher than that recommended in the latest scientific literature. The Victorian Department of Health uses a variety of data to determine the Heat Health Alert threshold temperatures, but this information and methodology is opaque to public scrutiny, with no explanation as to why their threshold temperature diverges from the latest scientific recommendation. The comparison of 2009 and 2014 heatwave events clearly show a reduction in mortality while there is an increase in after hours doctor consultations and ambulance callouts. The Heat Health alert system clearly plays an important role in forewarning and adapting behaviour. The Victorian Auditor General in his Heatwave Management report tabled in State Parliament 14 October 2014 was highly critical of the State Government finding critical deficiences in heatwave emergency response and governance. For a start, the Auditor General’s report identified that the Heatwave Plan for Victoria is not a state-level plan similar in scope to the State Tsunami Emergency Plan and a State Earthquake Emergency Plan, despite heat related deaths being the highest by far from all natural disasters in Victoria and nationally. Yet the Auditor General found “There was no statewide, strategic view of the combined impact of the different emergencies”, in response to the Victoria Police who took issue with the report being critical of the different levels of response and co-ordination to bushfires and heatwave impacts. Under the Victorian Emergency Management Act (2013) there is no specific mention of the management of the impacts of heatwaves or hotspells. Similarly, in the Emergency Management Manual Victoria while fire and flood rate numerous mentions in Part 1 – Emergency Management in Victoria and Part 2 – Emergency Risk Management and Mitigation in Victoria, there is no mention of heatwave or heat related risk management, mitigation or adaptation strategies. This is a huge oversight given the extent of the mortality rate from heat events and the necessity for engaging in mitigation and adaptation strategies and behaviours. This is even more alarming given the experience of the 2009 Victorian heatwave when not only human health was affected, but also deleterious impacts on electricity provision and transport services which produced a cascading economic and social impact. While much attention has focussed on the danger of bushfires, the combined emergency of heatwave health and bushfire impacts are not being managed strategically. Dept of Health (2014a) Heat Health alert for Friday 2nd January issued 30 December 2014. Entry filed under: heatwave, Victorian Government. Tags: Health alert, heat, heatwave, Melbourne, Victoria, Victorian Department of Health.